Hearts like these have been popping up all over the place and I'm sure you can find tutorials and instructions for something similar if you look. I started with a bunch of pink 2.5" squares that I had already cut - they are the basis for the single Irish chain baby quilts I frequently make. Sew 3 pink and 1 white/background 2.5" square together to make a 4-patch block as shown below. These little 4-patches should measure 4.5" unfinished. Don't worry if yours aren't exact, you'll just have to make some adjustments as you continue. Add a 1.5" strip of white/background 4.5" long (or the actual measurement of your 4-patch) to one bottom edge of the 4-patch. Press toward the white! (I don't press to the dark side all the time!) Then add da 1.5" strip of white/background 5.5" long (or the actual measurement of your 4-patch plus the first white strip) to the other bottom edge of your heart. Again, press towards the white! Piece them all together row by row - you'll be working diagonally, so keep it laid out on a design wall or on the floor or on a bed, so you can keep everything in order. Press each row in opposite directions, one row toward the top, the next toward the bottom. I found a sweet Minky backing that had embossed hearts. I took the remainder of the bolt that was here locally, but I also found it online at Missouri Quilt Co. here. Then came quilting. An all-over meandering design of little loopy hearts in a pale pink variegated cotton thread. This is where you need to be relaxed and put on your fav tunes and get in the zone! And just add a label and it's finished! A triple heart quilt - hearts on the front, back, and quilting. Doesn't it look soft and ready for baby cuddles? 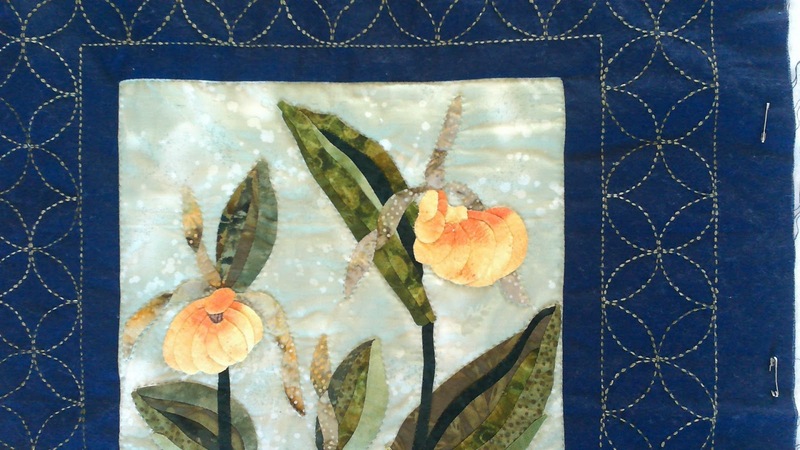 This piece began as a class from Renske Helmuth at Quilt Canada when it was held in Calgary, Alberta in 2010. It's my oldest unfinished project at the moment and my goal is to finish it this year! I took the class to learn to do needle turn applique and fell in love with the Sashiko stitiching used in the border. The Sashiko design was transferred to the fabric with a light box and a heat disappearing white marking pen. I don't remember the brand name, but if you want something that disappears after stitching, test first so you don't end up with permanent marks on your quilt. Renske was an awesome instructor, but I did eventually go back to doing the applique with a freezer paper backing that I'd remove when stitching was complete or nearly complete. I'm sure that if I had finished it soon after taking the class, I would have continued with her method of using the freezer paper on the front, but I left it too long! Normally, quilt borders are sewn on in four pieces, first the sides and then the top and bottom. 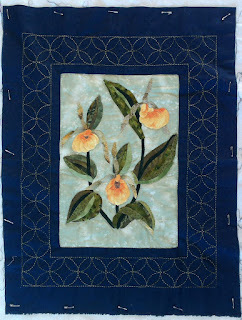 With the sashiko stitching, this wasn't possible and the instructions I had for this piece didn't include the how-to to put the border on. 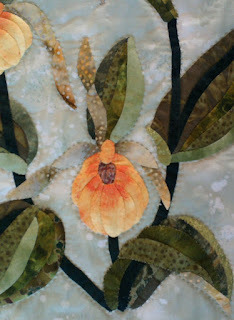 I ended up cutting the centre out and reverse appliquéing it to the lady slipper piece. I then added quilt batting and a backing and hand quilted around where I appliqued the border and around all the applique flowers and leaves. I'm still undecided if that is enough quilting or if I will do some more in the background. 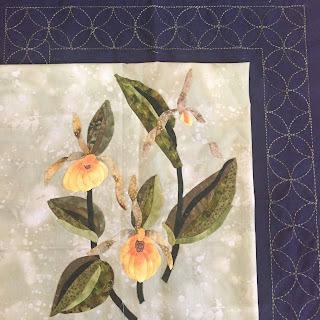 If I were machine quilting it (which I am not planning to do), I would fill the background with pebbles or some kind of texture that would make the flowers really stand out. Anyway, the jury is still out on that decision, for now, the hand quilting gives enough definition to the flowers. Keeping the border straight was a lot more difficult with the reverse applique than it would have been if the border had been stitched by machine. 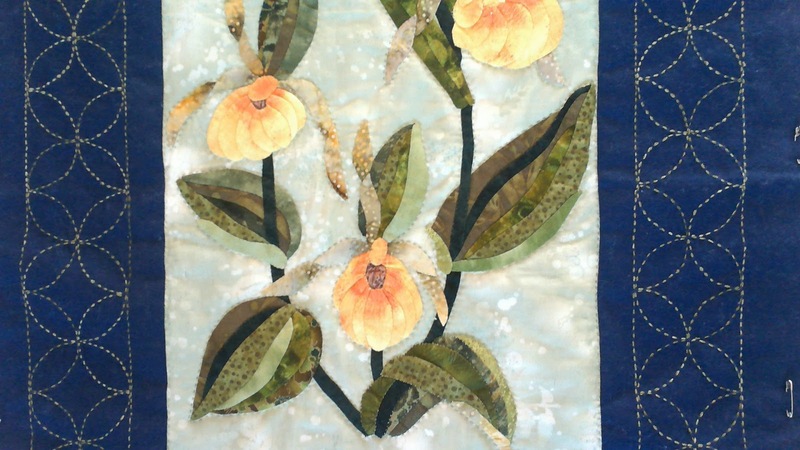 The shading on these flowers was achieved by using a variegated fabric with gradients from light to darker. 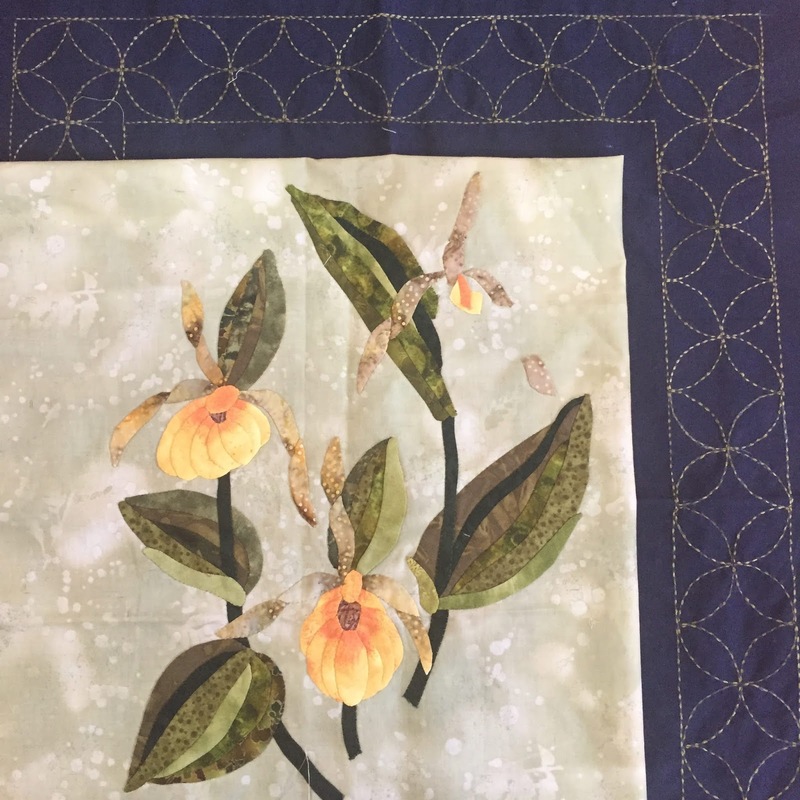 By placing the templated for the applique strategically, the lady's slippers look round and have depth they wouldn't have had with a plain fabric. But you could probably achieve the same effect by using a pencil crayon or Shiva paint sticks. All in all, this was a huge learning project for me and it's not finished yet! I intend to finish it, not with binding, but with a facing, including a sleeve for hanging. I've picked out the perfect place for it in my house to hang it. These tea cozies go pretty quickly, but I though I'd share the few I recently made. I use batting left over from quilting projects and for these tea cozies, fabric from my stash collection. The hardest part of these cozies is gathering the bottom of tea cozy onto the base. The first few times I've made these, I used my sewing machine to make the gathering stitches, but I found it was easier to gather when I used a 12 weight thread and did a running stitch by hand. I keep all kinds of ribbons and such from gifts and fabric bundles and try to use them for things like these cozies. I thought this black ribbon would look good on this tea cozy but I think I'll be changing it out to an ivory to match the lining. And what's a better than a tea cozy for your tea pot? A table topper to match! I'll post how I put this one together in my next post. Before Christmas I made a couple with card fabric for a local bridge club - always love doing something custom for people! There may be a few more of these in the next little bit as I've been having a good time making them!